Mark, I was thinking of making a top similar to yours. How much space do you have between them... looks like 1/8"? Do all parts have to be opened... just a little bit? 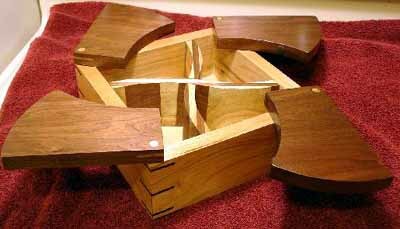 I was going to have my dowels go half way through to be out of sight... but yours looks nice... why should I bother? Would it be OK with you if added your box (along with others already present) to my collection? Joe, no problem add it to your site. For the top, each lid can be opened with out doing anything to the other lids. For the gap, I used a bandsaw to cut the tops out of one piece and then sanded. I ended up with about 1/8" for the gap. It's hard to see but I have felt on the lid pieces so they rest up against each other with out knocking. The trick is to scribe arcs with a radius the is equal to half the diagonal. Starting at one corner and working your way around scribe the arcs. 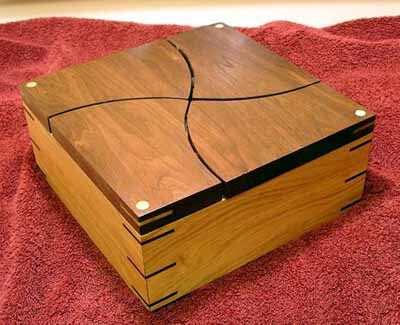 Then cut the lid on a bandsaw. The closer the box is to square rather then rectangular the better the top pieces look. Thank you for your permission and inspiration. Will post & PM when added. What do the lids pivot on? Are they just on a dowel that is loose in the box corner? 1/4" brass rod, covered by a 3/8" plug. Show me boxes, I need inspiration!